Call for presenters is now closed! The deadline to submit a proposal was December 15, 2018. All accepted proposals must register for the day they are presenting. 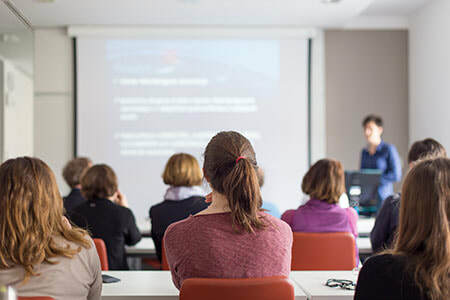 All conference presentations must provide high quality and comprehensive professional development for adult education and literacy. Presenters are encouraged to provide information that attendees can implement in their own programs. All selected presenters will be notified via email and asked to register for the TALAE conference. A minimum of one day registration is required of all presenters. ​Breakouts sessions are 90 minutes in length. Please ensure your information is concise and tangible allowing attendees the opportunity to retrieve and implement at their institution. Audience size may vary from 30 to 50 people. Round table sessions emphasize energetic discussion between the presenter(s) and participants about a central topic. Presenters will be asked to introduce the topic or issue, and then open the discussion for an exchange ideas and feedback among participants. Presenters will facilitate the discussion. Round tables are excellent opportunities for giving and receiving feedback, engaging in in-depth discussions, and meeting colleagues with similar interests. Panel discussions can highlight a select group of subject matter experts in their field and lend an interactive question and answer type presentation for participants. A PD Institute that organizes AEL research, courses and curriculum, PD events and other resources related to Program Management and Accountability, including, but not limited to, content related to institutional operations, TEAMS, data analysis, recruitment, intake, screening, assessment, advising, counseling, collaborations, and program improvement. The focus of the institute is on the administration and performance of AEL programs and its goal is improving performance, increasing quality, ensuring consistency at the local, regional, and state level. An intensive event or series of events designed to provide professional development on the topic of career pathways that presents and organizes information and presentations based on AEL research, best and most-effective practices, curriculum development, and systems integration for implementing Career Pathways models including, but not limited to: integration with the Workforce Solutions system; interagency and intra-agency coordination and collaboration; design of Workforce Training programs for AEL, including recruitment, screening, intake, comprehensive assessment, testing, career matching, documentation, placement, registration, and financial literacy/financial aid for workforce training; career, basic skills, and language assessment, testing, and placement; service delivery system aligned with local wisdom and LMI; college and career support; instructional design for IET programs; and employment services. Literacy is defined as an individual’s ability to read, write, and speak in English, and compute and solve problems at levels of proficiency necessary to function on the job, in the family, and in society. Aligning with the definition of literacy, the goal of the Literacy PD Institute is to organize and highlight AEL research, courses and curriculum, and PD events related to Literacy, including, but not limited to, content in ABE, ASE, ELA, special learning needs, family literacy, and health literacy. The Distance Learning & Technology Integration PD Institute provides evidence-based professional development for distance learning (DL), digital literacy, and the integration of educational technology. The focus of the Institute is to help educators utilize and apply technology tools, techniques and processes for facilitating learning and assessment as well as support teaching practices to improve learning outcomes. The Stakeholder Integration Support (SIS) PD Institute’s priority is focused on program and stakeholder needs and will give emphasis to critical PD topics centered on professionalization, recruitment, induction, orientation, and mentoring of practitioners working with WIOA customers. These are critical factors that impact customer outcomes whether the practitioner is an AEL teacher, a Workforce One-Stop intake and assessment worker, a vocational rehabilitation (VR) counselor, an instructor in developmental education or career/technical education, or a volunteer in a community-based literacy program.